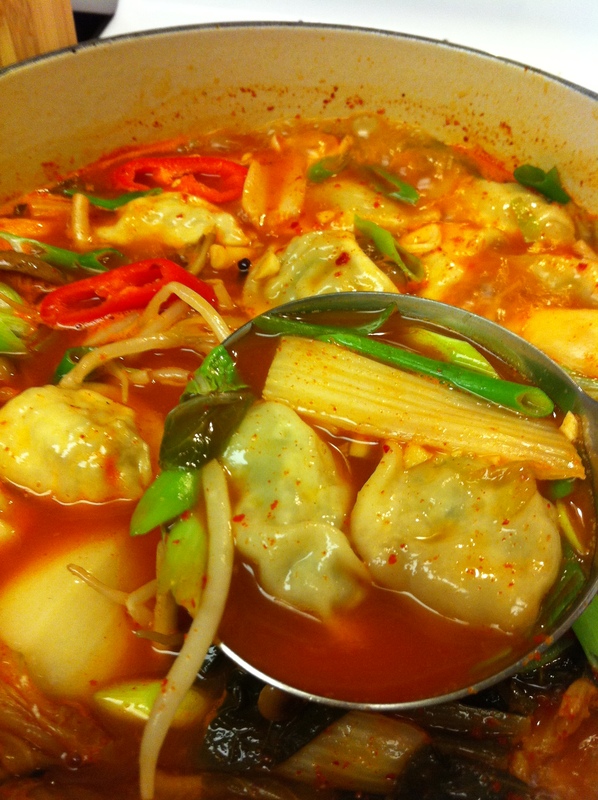 Last night, I decided to experiment with a new dish instead of my staple rotation and make mandul-jeongo, which is a spicy stew made of Korean dumplings and vegetables. I decided to make this dish because it seemed simple to make with ingredients I already had at home, except for a few vegetables and udon noodles I had to pickup at our neighborhood supermarket. The great part of this dish was that it was so hearty that we didn’t need any banchan (side dishes). 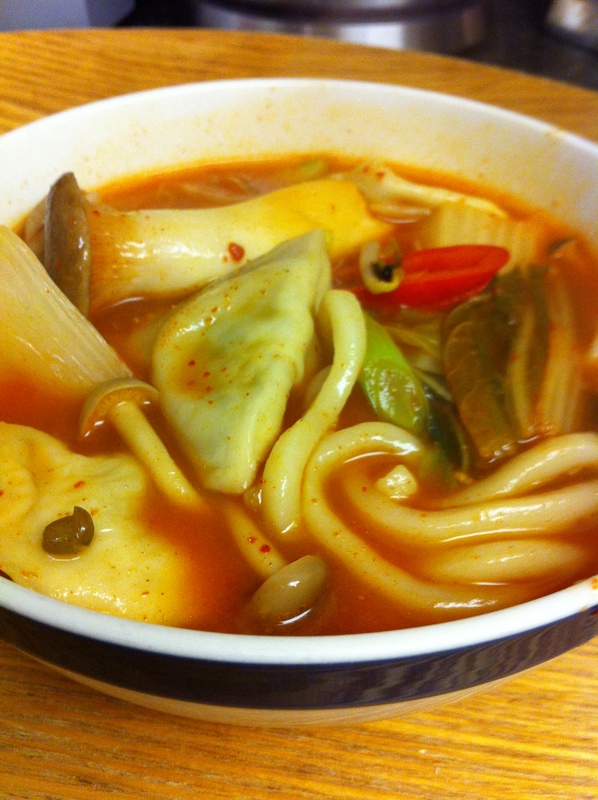 Even better was that I was able to make spicy udon soup with the left over broth for lunch today. It was delicious and tasted like a brand new dish but only took minutes to make. Perfection! Mix all the seasoning ingredients together and let it sit to marinate together. Boil 3 cups of water and add sake. Blanch the bean sprouts for about 2 minutes. Rinse in cold water and set aside. Bring the broth (or stock) to boil. In the meantime, cut the onion, bok choy, red pepper and scallions. When the stock starts to boil, add the 2/3 of the seasoning and let it boil for about 2-3 minutes. Add the onion and bok choy to the soup and let it cook for a few minutes. Add the udon noodles and frozen dumplings until the dumplings float. Taste and add the remaining seasoning if needed. Add a tablespoon of minced garlic. 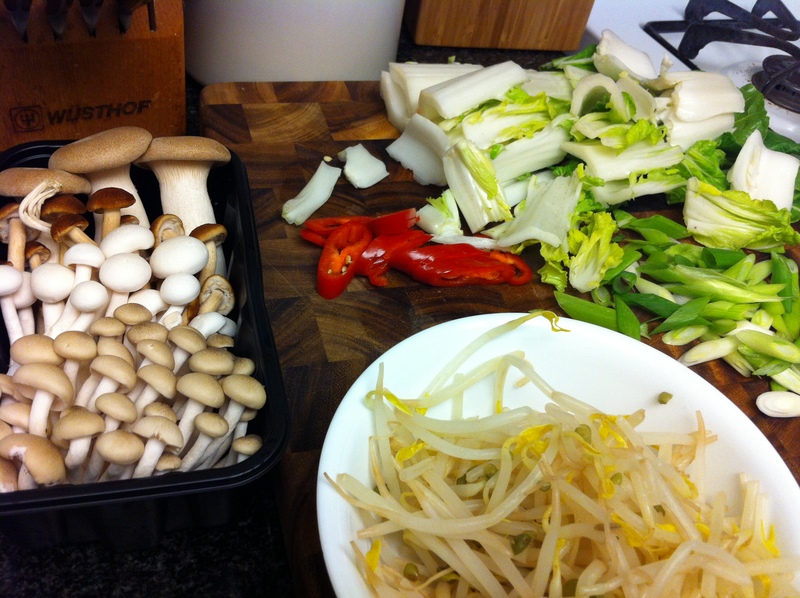 Placed the cooked bean sprouts in the middle of the stew, add the mushrooms and sprinkle the red pepper and scallion slices on top. Let it cook until mushrooms are soft. 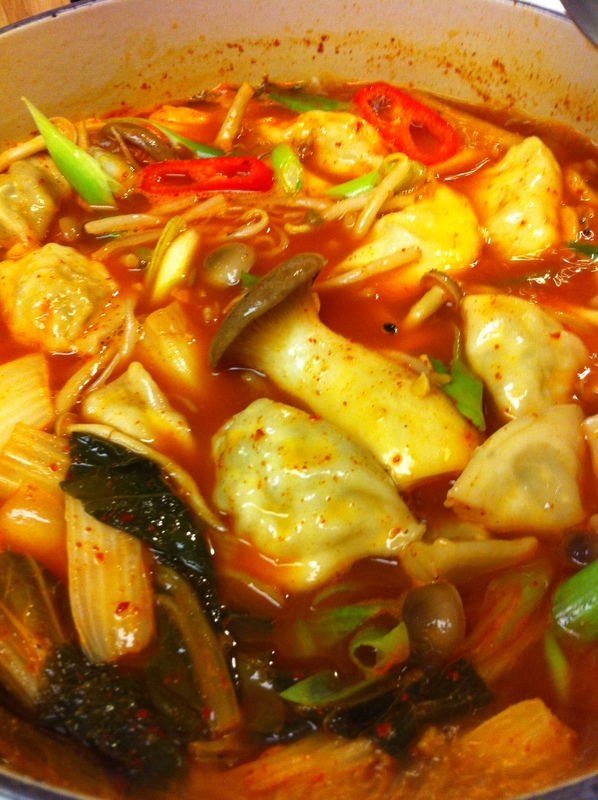 This entry was posted in Good for dinner, Main Dish, Soup/Stew (국/탕/찌게) and tagged Anchovy Broth, dumplings, Mandoo, Myulchi Yuksoo, Sagol-guk by gangnamkitchen. Bookmark the permalink.